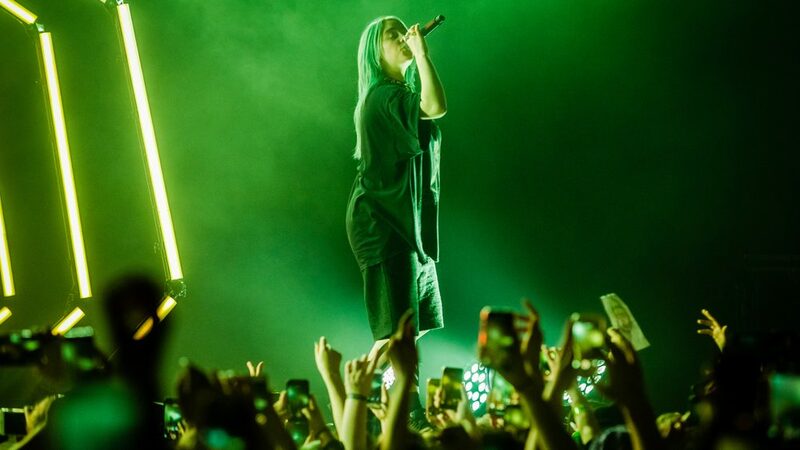 There are many reasons why I’m obsessed with Billie Eilish. Though she’s six years my junior, Eilish has become a personal heroine of my in a short amount of time. Her bold and unapologetic sense of style, her dreamy and haunting tracks, those powerbrows (no, really). But what drew me to her art in the first place wasn’t her art at all — it was her tics. Tics are defined as “repetitive movements and vocalizations” and are often signs of tic disorders or Tourette’s Syndrome, a neurological disorder characterized by the presence of at least one motor (movement) and one phonic (vocal) tic. For many people, it begins in childhood. Though it is possible to repress tics after lots of practice and strategies to stop them from being so noticeable, they do not typically go away completely and can continue throughout adult life. It is similar to ADHD or autism spectrum disorder in that it is considered as neurodivergent. I can’t blame her; I spent over a decade of my own life trying to hide my own tics when I didn’t even know I had Tourette’s. The bizarre background of my own journey started when I was 8 at a church Christmas play. I was one of the angels at the manger, but my behavior looked demonic. I kept stretching my neck like a giraffe. I had momentary relief each time, but it inevitably came back again throughout the birth of Christ. Medical professionals often dismissed it as an overreaction on my parents’ part –even when the possibility of it being Tourette’s was suggested — or completely in my head, even though it affects 1 to 10 out of 1,000 children. By the time I got to a neurologist, I was prescribed Zoloft in order to control the anxiety disorder that made them worse and was told that the problem would probably solve itself. I hoped with the medicine that I could be a “normal” kid. What my doctor neglected to find out between the push for medication to eliminate the tics was that I did not just have a temporary tic disorder, but full Tourette’s Syndrome. Between the pressure to fit in and to succeed, I didn’t want anyone knowing that I had tics. Or rather, I didn’t want to acknowledge to others or even myself they existed. If someone asked me why I blinked so much or something similar, I would launch into full defense mode, angry and in denial. “I don’t know what you’re talking about,” or the infamous — and totally effective — “No, I don’t!” became my go-to responses at school and extracurriculars. I would hate to watch videos of myself, mostly because I would be faced with the reality I never wanted to accept — that I was “weird”. Eventually, most of my tics subsided, which is a pretty common thing to have happen to someone with Tourette’s. By the time my senior year of high school hit, I was convinced it was a perceived problem I would never have to face again. I was relieved. That is until I was 22 and in graduate school. I was interviewed in a video as part of an annual class project. At the end-of-the-semester celebration, it was projected on a massive screen to the rest of the students and faculty in the program. I was met with images of me aggressively nodding, blinking, and fidgeting. I felt massive shame and embarrassment. Was this what my peers saw from me? When they heard my name, did they automatically think of those same, bizarre movements? At this point, I knew I could no longer ignore it and had to face reality. When I ranted and cried to my boyfriend that night about how humiliated and insecure I felt. “Well, maybe you have Tourette’s,” he suggested. I didn’t take it well, mostly because I knew I would obsessively look it up on WebMD and similar sites. However, my annoyance was short lived and turned into a realization. When I looked up the signs and the symptoms, almost everything about my life matched perfectly. Initial tics begin around the same age my Nativity Giraffe Neck incident had occurred. I started to piece together evidence collection such as testimonials from my friends about what kinds of tics I had as well as requesting old medical records. After over a decade, I discovered I had been diagnosed with a tic disorder, anxiety, and OCD as a child, but no one had ever put the puzzle pieces together before that moment. When I brought the evidence to a new neurologist, I finally confirmed I did, in fact, have Tourette’s. I was relieved to know that my strange movements were not my fault. Most importantly, I finally gave myself permission to own a part of my identity I previously never wanted to face: my neurodivergence. As part of my journey to acceptance, I began looking for stories similar to my own, including famous faces. Many of them were men, as studies have — so far — shown that Tourette’s affects more boys than girls during childhood, even though tic severity increases for adult women. I hadn’t heard of Eilish prior to seeing a Facebook post about her diagnosis, but I instantly fell in love with her unconventional style in music, in fashion, and ultimately in life. The fact that she has tics similar to my own were an added bonus. On her official Instagram statement (also featured in her highlights simply as ‘FYI’), she noted, “My tics are only physical and not super noticeable to others if [you’re] not paying attention.” When looking closely at the videos, it’s true. They tend to be subtle movements, but are unmistakably tic-like in nature. When she followed up in early March of 2019 about living with Tourette’s, she noted that she has learned to suppress her “bad tics” and that the public has not seen the worst of them. I’ve connected instantly with everything she has said about Tourette’s the way I connect with her art. Though she does not attribute her “goofy” personality to her Tourette’s, Eilish inspires me to keep owning both the unique and the tough aspects of Tourette’s and neurodivergence in my day to day life. While it is by no means Eilish’s responsibility to be a constant voice in the Tourette’s community or to contribute anything else about her experience beyond what has already been shared, any additions to the conversation will continue to do a lot for those who were like me — searching for permission for us and our tics to not only exist, but thrive in a world that tells us to shove them away. In the meantime, I’ll be enjoying her new album. Gretchen Gales is the executive editor of Quail Bell Magazine. She has been interviewed for her writing achievements at Dear English Major, Her Campus, and For Creative Girls. Gretchen's writing, both formal and literary, have appeared in Ms. Magazine, Bustle, The Establishment, and more.